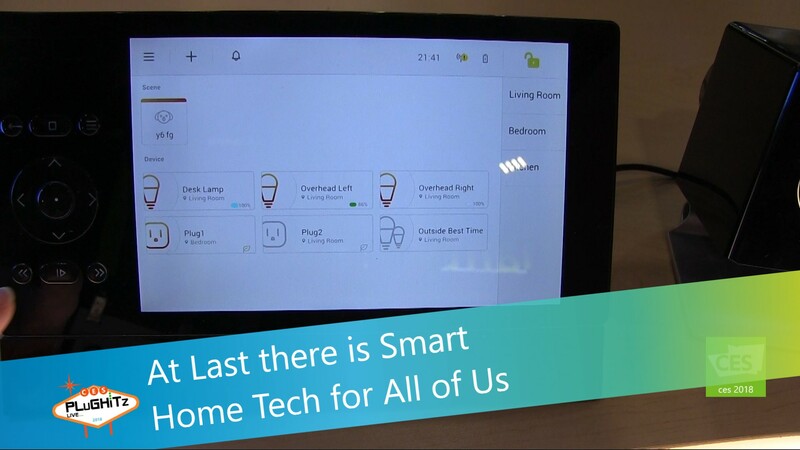 Not the most techie person on the planet but still want awesome smart home features? Don't worry, Oomi has got you covered. Their new additions make IoT easy for all of us, and without sacrificing features or safety. They also wanted to build in entertainment control to the system. In the past, this hasn't been so easy in a touch screen environment because you're looking up at the TV when the controls you need to view are down in your hands. So they developed tactile controls that can be programmed to your specifications to control all of your entertainment. Because let's face it... we all need buttons sometimes. The best part about this new in-home, whole-home controller is how easy it is to set up. It has a small orange button on the back of it. And each companion product also has a small orange dot. To pair everything together, you simply connect the dots and voila, setup is complete. They use NFC in the pairing process to make it extremely simple and user friendly. The touch screen has also been designed to be easy to use. You just name the rooms and the devices and you're ready to go. The system is also able to accept some third party smart home devices, such as Amazon Alexa. All of the new items are available now except the touch switch module which will be coming soon. It's the only one that will need installation as it is also a scene controller in an elegant design that looks like a traditional wall switch. To easily get started, kits are available, which come with the Oomi Touch controller, Oomi Cube hub and a set of sensors. The Lighting Kit retails for $499 and comes with 2 Oomi Bulbs and an Oomi Plug. The Automation Kit retails for $499 and comes with an Oomi Bulb, an Oomi Plug and an Oomi Door/Window Sensor. The Security Kit retails for $400 and comes with an Oomi Door/Window Sensor, an Oomi Multisensor and 4 Quick Tags. Other accessories are also available to expand your smarthome.